Jag deltar i: Live and Love Crafts (Summer garden), Bearly Mine (One for the Boys), Papertake Weekly (Sketch #42), Glitter'n'Sparkle (Cute), Allsorts (For the Guys), Chocolate, Coffee & Cards (Embossing), Crafting for all Seasons (Boys will be Boys) och Creative Knockouts (Summer's Coming). Such a fun card with beautifully colored image. Thank you for joining us this month at Bearly-Mine Designs "One For The Boys" challenge and good luck in the draw. Hope we see you again! Oh this is such a fun card with beautiful embossed layers. It certainly is getting ready for summer. Thank you for playing along with us at Chocolate, Coffee and Cards. 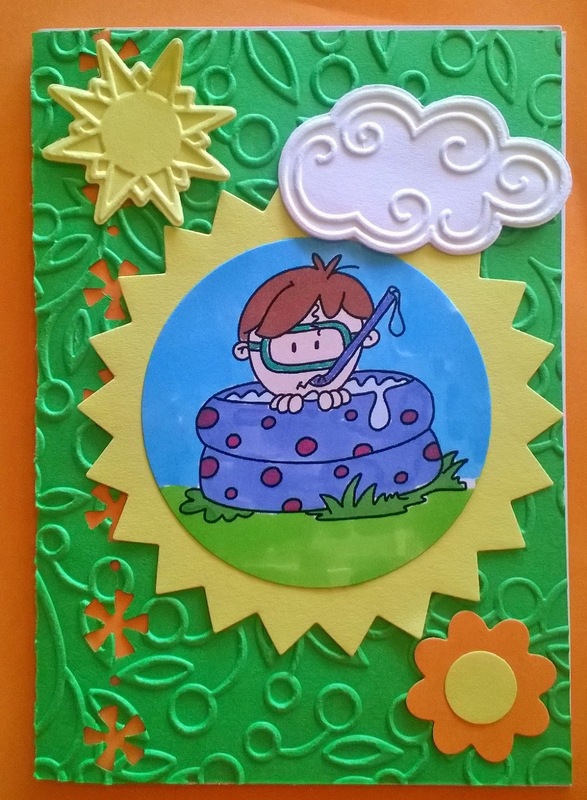 What a fun card & cool embossing. Thanks for joining us at LLC for our Summer Garden challenge. How cute is this card! The embossing is wonderful! I love the cloud! Great job!